Here you have an E-Flite EFLH1057 HP6DSM (6) Channel SPEKTRUM SERIES Transmitter For The E-Flite SR Micro-Electric Helicopter !! 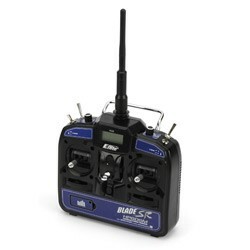 This is a new all original Transmitter that comes with the E-Flite SR Helicopter and will work with ALL the E-flite DSM Spektrum Series Micro's and 6100e Series Receivers !! This Transmitter will work with the E-Flite CX2, CX3, Bind & Fly MCX Ultra-Micro, Mcx S300, Mcx Tandem Rescue, MCX2, CP PRO2, SR, 120SR and many other Micro-Heli's and Airplanes that support the Spektrum DSM 2.4 GHz series receivers !!! These radio's are (6) Channel, they are hard to find at a reasonable price and they list for $125.00 plus tax or shipping at any hobby outlet. So take this into consideration, buy accordingly, and pick one up for a spare, upgrade, replace an old unit that is glitching, Upgrade to (6) Channel so you will have the extra features, or save for that next heli or airplane project that you know you will need it for !! You can't go wrong when you will receive a (6) Channel 2.4Ghz Interference Free High Output SR Transmitter, you have a Low Purchase Price Of Only $34.99 and if you buy now you can receive in just a "few days" !! Why pay $50.00 or more for the standard (5) channel when here you can have this (6) channel with all the bells and whistles for a the great price of only $34.99 !! Please view all photo's and see how nice these Transmitters really are !! So now take all of this into consideration BUY NOW & SAVE !!! I only have one of these SR Transmitters available at this "Great Offer" so act now or loose out !! OK, so Thank You For Looking and Please Check My Other "BUY IT NOW OFFERS" For More Heli Transmitters, Parts, Upgrades, Accessories And Many More Great Specials !! Also please buy with confidence and feel free to phone or e-mail if you have any questions ! !